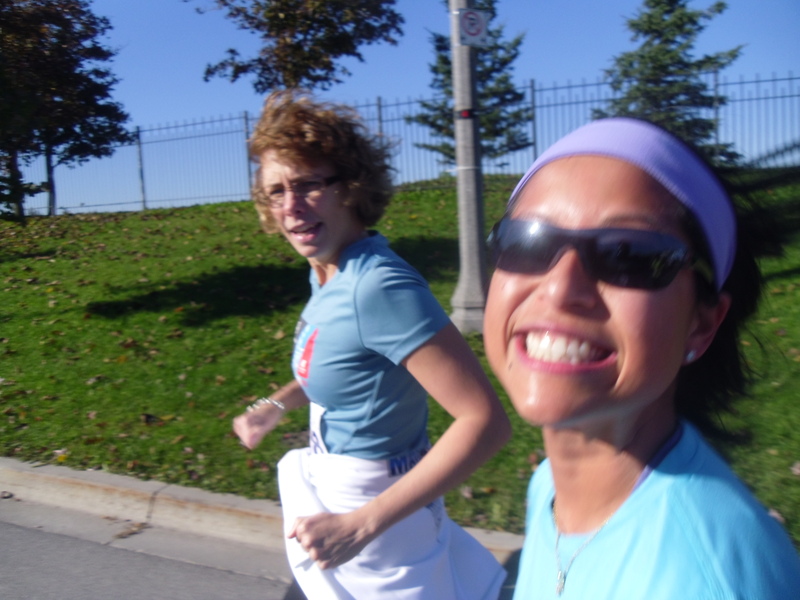 Sunday November 6, 2011 was the Angus Glen 10k race in Markham, Ontario, which was held at the Angus Glen Golf Club. 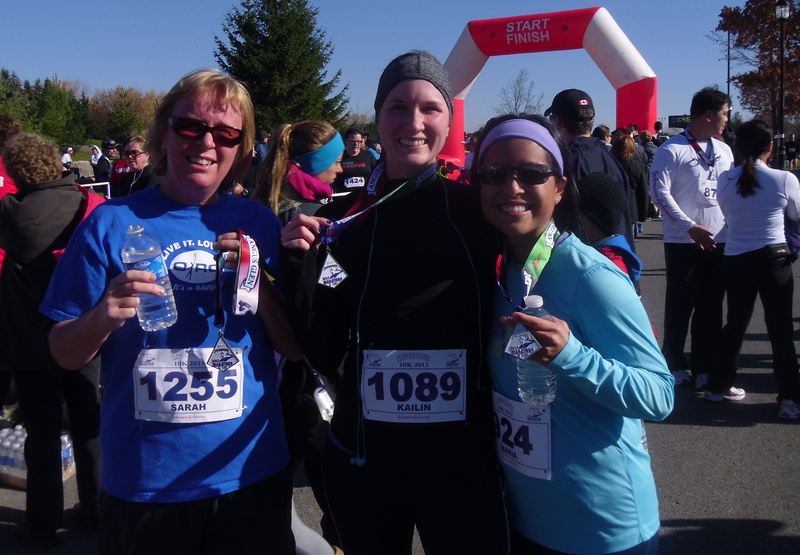 Unlike last year when I raced this 10k with three of my Nomad’s Running club members, this year I ran this 10k with the goal of pacing Maria to a comfortable, yet respectable time. Maria’s training regime has slipped quite a bit since she had Mason, so we wanted to finish this race strong, yet in one piece. Our game-plan was to run the first half of the race at a 6 min/km pace, and then speed up to a 5:30 min/km for the second half of the race with a goal time of 57:30. The Angus Glen race was known for it’s graciously full goodie bag and the buffet post-race meal. When we arrived at the golf club, we were greeted by Susan, Kailin & Julie, three of Maria`s co-workers from Credit Valley Hospital. 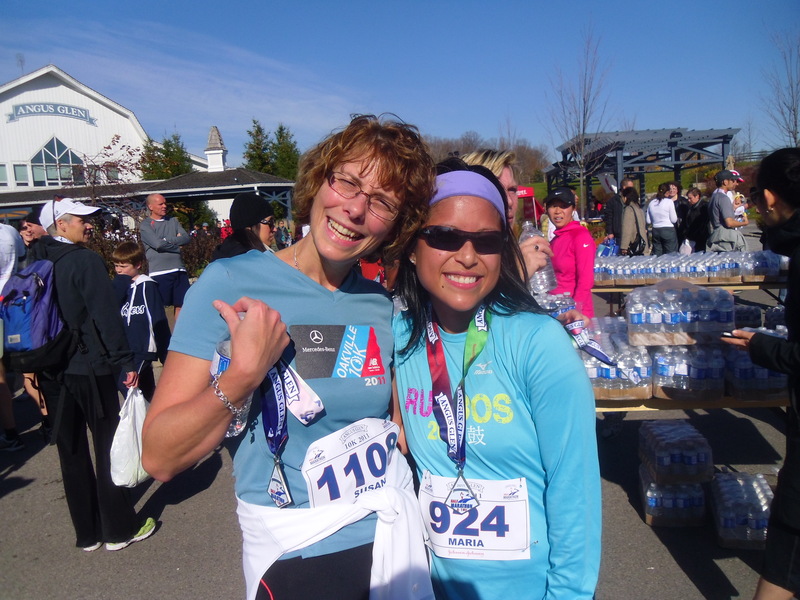 Maria was able to convince a few of her fellow Radiation Therapists to participate in the race with the swag & meal, being the main selling point. Kailin had picked up our goodie bags ahead of time, so she have us our kits filled with our race shirt, bib number and about $50 worth of lotions & bath products. (Johnson & Johnson is the race`s main sponsor). Then Susan told us that we also get our own Lockers in the change room and our own towel for a hot shower afterwards. This was an added bonus that Maria & I didn`t know about. The race was perfect. Great weather and the course was relatively flat with only a couple short inclines. At 5km, Maria was successfully able to pick up her pace to the projected 5:30 min/km, and then with 500m to go she was able to shift into and even faster gear. With 100m left, Maria pushed the ‘turbo’ button and started sprinting to the finish line. Final chip time was 57:27. Not her best 10k but definitely the best post-pregnancy. The post-race meal was as good as advertised. An assortment of buns & cold cuts, egg salad, tuna salad, potato salad, Caesar salad, cold slaw & an assortment of fruits & pastries for dessert. This was much better than your typical bagels & bananas at most races. Maria said this was Day 1, on her ‘Back to Running Plan’… Let’s see if she sticks to it. Happy Running!